I am taking a departure from my normal knitting projects (sweaters, hats, socks, skirts, etc) and I’m heading into blanket territory. This week I had to make an exception. My son and his wife (hereon out known as “my daughter”) are expecting their second child, a little girl, and I think special times call for special measures. 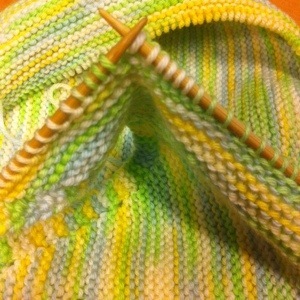 So… Here I find myself knitting this little baby blanket. I’m making pretty good progress.